Today we got up, had breakfast, and loaded onto the Twin Otter to fly up to the EastGRIP site, which is about 300 km north of Summit Camp. EastGRIP is interesting for a number of scientific reasons. It is the upper end of the NorthEast Greenland Ice Stream (so the site is also known as, or was formerly known as, NEGIS). An ice stream is like a river of ice that flows through an otherwise slow-moving ice sheet. This means that it slides very quickly on the bed (rock below the ice) like a big plug of ice (that is why we call it plug flow), whereas a significant portion of the movement of the slower surrounding ice is due to deformation of the ice itself. NEGIS drains a significant portion of Northeast Greenland, which means that it is a conveyor belt moving ice from inland to the ocean. Understanding how ice streams work is essential to understanding how the ice sheets will respond to a warming climate. EastGRIP is also the site where the next deep ice core in Greenland is being drilled. This international effort is led by the Danish group at the Center for Ice and Climate in at the University of Copenhagen. The ice core will provide a record of past climate and will hopefully help us understand the dynamics of ice streams and how they form. We have a FirnCover station site set up at EastGRIP. 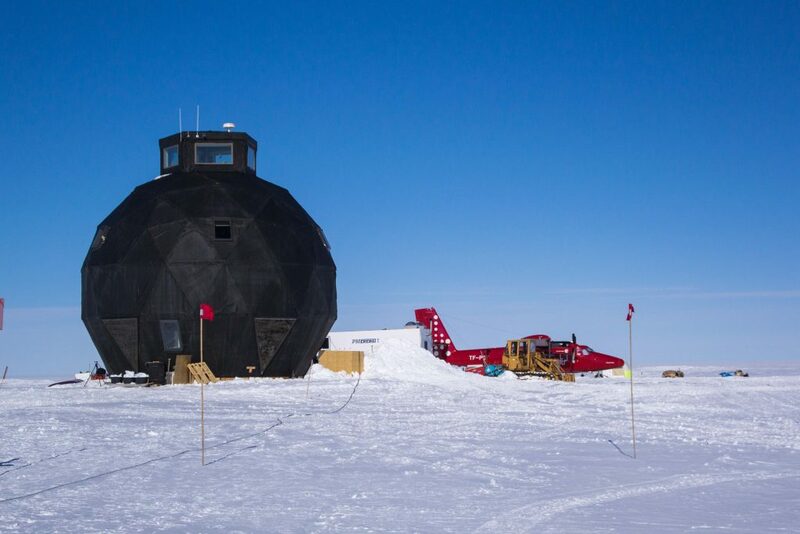 It is an ideal location for us to have a station because the ice-core camp maintains a runway there, there are good weather observations and records, and the data we collect there can complement other data that has been and will be collected there. It is in the dry-snow zone, which means it very rarely gets above freezing there. The firn compaction that we are measuring there is thus much simpler (although still complicated!) than at the southern sites, where each summer warm temperatures produce surface meltwater, which in turn percolates into the firn and creates ice lenses. Measuring the compaction in the dry firn at EastGRIP (and Summit) provides a good baseline that we can compare the wet-firn sites to. Anyway, we landed at EastGRIP just after 10:00 AM. We were invited into the “dome,” the Danes’ primary shelter. We were treated to a bit of banana bread and some coffee (life is good!) before we got to work at 10:47 (Liam documented this). As promised, Baptiste again drilled the core by hand with assistance from Mike. Liam logged the core, and Aleah and I did her permeability work. We were done with the core and permeability work just after 1:00, which meant we were late for lunch, but it was nice to finish those tasks! 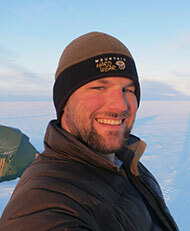 It was quite a cold morning of work – the temperature was around -20 C and the wind was blowing a bit. Liam even got a bit of frostbite on his nose. The EastGRIP crew treated us to a delicious hot lunch – chili con carne, spanish rice, quesadillas, guacamole, and corn bread! When we were done eating we would have preferred to just nap on the couch, but we headed back out to finish the job. Aleah and I did snowpit analyses and Mike wired in the new compaction instrument – it ended up being a relatively simple afternoon. We went back to the dome, and we treated to beer from a tap – the crew there has a keg system! Wow. Luxury! We also got a tour of the tunnels that the EastGRIP crew will use for space to drill the new ice core. They first used a giant snowblower to dig trenches 6 meters deep. 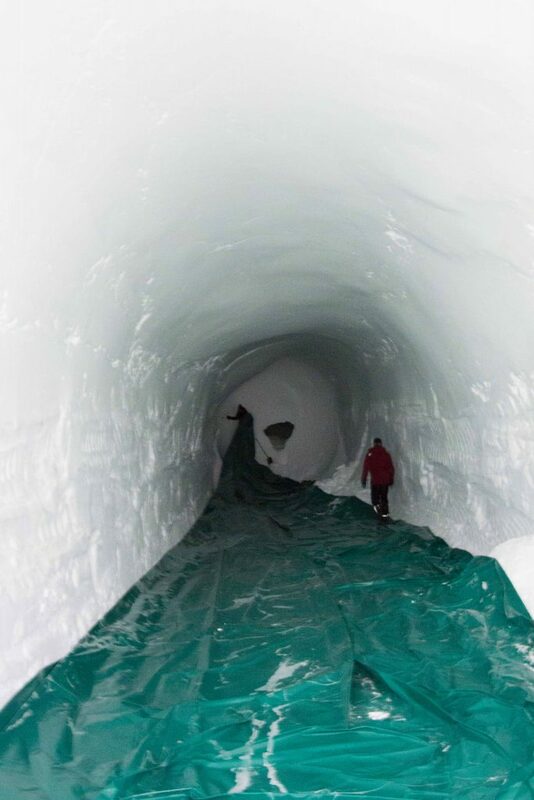 Then, they inflated giant balloons in these pits and blew all of the snow back on top of the balloons. They let them sit a few days and the snow hardened. Today they deflated the balloons and were left with several giant tunnels under the surface of the snow. They will use this underground space as their ice-core processing laboratory and for the actual drilling – it is a perfect shelter to work in! We hopped back on the twin otter around 5:00, which got us back to Summit a bit late for dinner (sorry, Summit crew!). It was another amazing meal: pasta with lemony-garlic-shrimp cream sauce, bleu-cheese stuffed pears, garlic bread, salad (! ), asparagus (!) and cake. We settled in for a mellow evening, planning for an easy day of work tomorrow at Summit. But, just as we were kicking back, we were presented with new alternate plans! And, we have been talking about those since and now we still have no clue what we are doing tomorrow and for the next few days. So, stay tuned for tomorrow’s update!